On the western seaboard there is a city, Sananadvlpa, where the people are both rich and righteous, as in the paradise of Indra. Not an Indra but a king ruled there, who was fond of his subjects, and he had a handsome son named Manohara. The prince knew everything there was to know, but he had a special preference for the art of perfuming. (People have different tastes, and somebody always likes something better.) The prince had two friends, Bakula and Asoka, and the two were inseparable like asoka and bakula trees in springtime. One day when Manohara was with his friends in the princely chambers, the footman came and announced with a bow: "A certain Sumangala wishes to see Your Highness. He is an expert perfumer and a quiet-spoken cultured gentleman." "Go and let him in," Manohara told the doorman and hurriedly scented himself and burned some incense. Sumangala was admitted, but the instant he entered the room he buried his face in his hands, shuddered, and shrank away. "The incense disagrees with your perfume and the scent of your flowers," he said, "and the smell makes my head ache!" He took a perfumer's palette from his traveling bag and, studying Manohara meanwhile, mixed his own incense. Only then did he greet the prince formally. "Burn this incense instead," he said. "It blends excellently with the perfume and the flowers." The fragrance convinced Manohara and his friends that Sumangala was a master perfumer, and he honored his guest accordingly. Sumangala was received with great hospitality, and within three or four days he cleverly ingratiated himself with the prince. One day Manohara went out with his three friends to visit the enchanting Fair of the Yaksas. As the prince strolled around looking at the wonders that were displayed, his eye was caught by a painting of a Yaksa fairy. Though it was lifeless, it seemed to vibrate with life; mute, it seemed to whisper to him; and though the girl was only a painting, the prince fell in love with her and placed her in his heart, ignoring everything else on view, however enchanting to eye and heart. He burned incense for her alone and worshipped her with flowers and perfumes. Indeed, his passionate love so distorted his judgment of what could be enjoyed and what not that he even tried to rip her robe off her hips. And that very instant she rose from her painting as once the Lotus Goddess rose from the lotus pond and sought Visnu's breast in the dark expanse of the sky; and she spoke to the prince. "I am Sukumarika the Fairy. The Lord of the Yaksas cursed me and condemned me to live in a painting. But Kubera's anger is brief, and his mercy for women great. When I implored him to set a term to his curse, he pondered awhile and then reassured me, saying, 'As soon as a mortal man attempts to violate your painted body, your curse will be ended, and the man shall be your husband.' Even the curse of the great ones is equal to a boon! If you love me, then come to the palace of gods and demons on Mount Srikunja where the Yaksas dwell." The fairy vanished, and so did Manohara's reason. Bakula and the other friends were desperate when they saw his condition. But they had heard what the fairy had said, and, when the prince regained consciousness, they said: "Enough! Don't despair, for Sukumarika is easily found. If that mountain were inaccessible, she would not have spoken as she did, for she wanted your love." One day when the prince with his friends went to visit his father at the court, he met a merchant who had just returned from sea. The merchant, whose name was Siddhapatra, had just presented precious stones of the first water to the king and was graciously received. The king asked, "What wonders have you seen, my dear sir?" "Sire, is there a wonder you have not seen who live on the shores of the ocean? The sea is the treasure house of all wonders! Yet, once when my ship had been blown off course by a gale, I saw above me in the sky a mountain garlanded with lofty peaks that shone with the yellow luster of solid gold. I asked one of the mariners what mountain that was, and he answered, 'The old people say that that is Mount Srikunja." The merchant related other anecdotes and at last went home. The prince immediately bowed to the king and went after the merchant. In his consternation the merchant at once offered the prince all his possessions: what rich man does not tremble when the prince comes to his door? But the prince took nothing more than a garland of flowers, remarking that children of one father ought not to offer hospitality which insulted their brother's generosity. "However," he continued, "the story you told to my father's feet about Mount Srikunja has made me curious. Please describe it more clearly." Relieved at the kindly words of the prince, the merchant began describing Mount Srikunja in greater detail with all the landmarks. "One day our ship sailed into a gale and, like a wild elephant in heat, lost its balance and got completely out of control. When the gale had spent itself and died down, and the ocean was again as smooth as the skies above, we began to meet curiously shaped water animals. Here we saw lions, tigers, panthers, rhinoceroses, bears, and antelopes— herds of them—jumping and diving for the sport of it. Farther on, we spied naked men and women consorting in pairs. Their yells, which pierced our ears, seemed to be their only language, and they behaved like beasts. Elsewhere, gigantic winged elephants flew up from the surface of the sea like restless mountains. Then, suddenly, a northern breeze wafted down a perfume so divine that I think the whole world would gladly become nose just to smell it. We looked eagerly for its source and saw in the distance a mountain whose jeweled peaks were peopled by demigods. 'What mountain is this?' I asked a sailor, and he said, 'The old people call it Mount Srikunja." The merchant went on describing the course, and the prince charted everything on a detailed map with all the directions and distances by sea. Then he had a ship readied and manned by a crew of reliable sailors and set sail on the high seas with Bakula, Asoka, and Sumangala. Strong favorable winds sped the craft, and soon the prince reached his point of destination. The landmarks corresponded to those he had noted on his map, and he was certain that this was the place. And his thoughts, eyes, and body rushed alike to Mount Arlkufija. The ship was moored at a quay from which rose sapphire paved steps, wide as the firmament and lofty as hope, which were sprayed by the sea. Manohara left his companions on the ship and eagerly climbed the stairs to the summit, even as the just man ascends by the steps of virtue to the vault of heaven. While throngs of joyous Yaksas and Fairies watched, he went about looking for Sukumarika with the eye of love. As the fairies expressed it, "Lucky Sukumarika, to have inspired such love in a man so divine! Is there anyone, god, demigod, or mortal, who would not be charmed by his handsomeness, by his talents and virtues, natural and acquired?" Then Manohara saw his fairy: she was rollicking in the wide Courtyard of the palace as she was in his own loving heart. With no more modesty than any woman, who lives by her beauty, she rushed to meet him, took his moist and trembling hands in hers, and conducted him inside. In the palace he met her tipsy, ruddy, red-eyed, paunchy father, who was playing dice. He embraced Manohara and kissed him on the head "Go and see your mothers-in-law," he said and dismissed the prince to the seraglio where the women were waiting They were beautifully decked with karnikara garlands, and all were in the prime of youth, even the grandmothers of his parents-in-law. He greeted them, and they returned his greeting. Then they permitted him to leave, and in a passionate mood he entered the girl's chambers. Drinks of divine mead, music of divine lutes, and the embraces of a divine woman carried Manohara's mind away. Hardly a moment seemed to pass before Sukumarika said: "It has been five days now, prince, and you must return. It is a rule in the world of the gods that a mere mortal is not to stay longer than five days at a time. Besides, your crew might desert you. They never wait more than five days for the master of the ship." When the prince heard this, his splendor darkened and darkened like the splendor of a godling who is cast out of heaven. But, seeing his condition, Sukumarika added, "From now on I myself shall come to your house." This comforted him, and he returned to his ship, where he found his crew exasperated at his long absence. His friends were wearing divine jewelry, robes, and garlands. "Where have you passed your days and how?" he prompted them. "As you yourself have," they answered. "Sukumarika sent Yaksa girls who were quite glad to come, and they have pampered us like gods! Men may worship the Great Lord, but they have to die before they can be united with Him: we worship you, O Lord, and become gods before we die!" So absorbed were they all in the discussion of their women that they crossed the wide, perilous span of the ocean without thinking of anything else. When they entered their city, they found the streets empty and all business, whether in pursuit of Virtue, Wealth, or Love, completely stopped: the town was grieving over the absence of its prince. Then an old brahmin lady came out on some errand and saw Manohara, who had covered his face in respect. She recognized the prince, and in an ecstasy of bliss which made her stumble on the road, she hastened to the court and gladdened the king. The king ordered his ministers as well as the merchants not to ask the prince where he had been and thus to save him from embarrassment. The prince greeted the king shamefacedly, but father took son to his heart and brushed away his shame. When the prince had returned to his own palace, he told Sumangala: "Create the perfect incense which is the epitome of the entire art of perfuming! My mistress is coming tonight, and she will bring her friends along. As they say, the most important thing in making love is the perfume. Our most exquisite perfume is called 'Yaksa mud,' and that is precisely what it would be for such divine women—mud. Concentrate on a rarer scent and reveal your mastery in the art. In the arts, it is the result that counts: the whole point of the art of archery is hitting the target." Thus prompted by the prince as well as by his own interest, Sumangala prepared incense, bathsalts, perfumes, and whatnot according to his master's instructions. Meanwhile Manohara and his companions conducted themselves in the true fashion of lovers and took to their beds of torture, as yet empty of their mistresses. The perfume that Sumangala had created with such a great care was suddenly, exquisite though it were, swept away by another as a fresh wind blows away a cloud. Sukumarika entered and sat down on a couch. She smiled at Bakula and the other friends and said, "I have brought my friends. Go and enjoy yourselves!" They bowed and were gone. Sukumarika and the prince spent the night together as they had yearned to spend it. In the morning the glowing appearance of the prince's boon companions sufficed to tell Manohara their exploits of the night. Apart by day but rapturously united at night, the couples passed a year together, though the women soon made their men lose track of time. Then, one night, Sukumarika's face streamed with tears as she said, sobbing: "You are your own master, but you have consorted with servants. Starting today, I shall have to wait on my master, God Kubera, for a year. That means that I and my friends must spend the year in chastity. But I shall be going home once a week to honor my parents, and you must come too. Merely seeing the space through which you have passed is enough to make me live; but seeing you in the flesh is an elixir of life that shames the nectar of immortality!" With these words she left. Hardly was she gone when the prince’s companions came in and found him gazing up at the sky and muttering, "She is gone!" But while the prince and Bakula and Asoka grieved, Sumangala rejoiced. Stuttering with excitement, he cried: "There is no reason to despair! Come and embark on my ship. We know the way now, and we can reach the mountain of the Yaksas in no time. Let us spend the year there, dreaming of our loved ones and seeing them from time to time, and so enrich our lives with both hope and fulfillment!" They set sail on the high seas in Sumangala's ship. The vessel sailed into a gale, was thrown off course, and came to grief. The prince was so absorbed in his beloved, like a sorcerer in a spell that has worked, that he failed to notice the disaster, which threatened him with a terrible death. Yet he made the shore safely. As he crawled onto the beach, a band of robbers seized him and robbed him of his jewelry. A cavalcade of horsemen appeared soon and surrounded the bandits, cut them down, strung them up, and hanged them from the trees. One of the horsemen, a pleasant-looking gentleman, came forward, bowed deep to the prince, invited him to mount an elephant, and rode off at the head of the cavalcade. They had gone but a short way when they reached a city. Bards joined the procession, singing the praises of the prince's virtues and lineage as he rode into the city through squares that were carpeted with saffron flowers. Garlands and banners encrusted with precious stones bade him welcome, the stones as they struck one another making clear, tinkling music like swarms of iridescent birds voicing their sweet songs. Then he entered the gates of the royal palace, of a splendor commensurate with the city's, and rode up to the king, who like an Indra was sitting in a magnificent pavilion. The prince dismounted and saluted the king. The king hugged his visitor affectionately and studied him for a long time, his gaze wandering with admiration over the well-proportioned figure of the prince. "Ah," exclaimed the king, "who has eyes like Sumangala?" The prince thought, "Could he mean the same Sumangala? Has he survived the shipwreck as I have?" "Go, my friend," resumed the king, "and refresh yourself." The prince went inside the palace, and there he saw his own Sumangala, who stood before him bowing. "Sumangala," asked the prince, "are they safe, the friends whom you love as your life, Asoka and Bakula, who are my right hands?" "Asoka and Bakula are safely on their way home," he replied. "Please hear how I myself have arrived here. This is the city of Nagapura, famed in romances for the greatness of which you yourself are a witness now. The king is Purandara. He has a son Jayanta, a handsome warrior and gifted poet; he is the one who brought you here from the woods on the beach. The king has a daughter Nalinika who does not find her match in the whole world of women. Nor did she find her match in the world of men; and the king, searching for a suitable bridegroom, dispatched to all corners of the archipelago a series of scouts who were perfect judges of beauty, talent, and character. They never returned. "I drew a portrait of Nalinika on my tablet and traveled about the eighteen continents of the earth in search of a bridegroom. When I failed to find the right one, despite all my efforts, I was so discouraged that I sought to kill myself and set sail on the seas. I came to Kananadvipa, and as I walked about the town, I constantly met groups of respectable people who talked of nothing but your virtues. My resolution to kill myself, which had lent fortitude to my uncertainties, was swept away by your fame, as light sweeps away darkness. People had told me that you were addicted to the art of perfuming, and so I made it known to you that I too was a student of the art. Servants soon find favor with their master if their interest and knowledge are the same, even though they lack all virtue. "You and your friends purposely burned an incense that disagreed with your perfume and the scent of your flowers, in order to try my knowledge. While I prepared a more harmonious perfume, I studied the princess' portrait which I had painted on my perfumer's palette. And as I looked at her and then at you, I knew that I and the princess and the creator had succeeded and that our existence had not been in vain. While you yourself carried me away with your virtues of goodness and charm, I was bent on my own design to carry you off. However well I was treated, I remained intent on my plan to abduct you, for servants who wish to please their masters don't draw the line at crime. Sukumarika herself was driven off, under the pretext of palace service, by the powerful good karma of Nalinika which made her union with you inevitable. "Once I had found a way, I lost no time and by rigging the ship contrived to drop you into the sea. There has never been a shipwreck in that part of the sea where the waves carried our ship to its doom ! Bakula and Asoka were able to sail home on the same ship without being marooned I reached the city in the same way as you did. "Therefore, Your Highness, take Nalinika to yourself, for the goddess of fortune, arriving in person, will brook no delay!? Thus the prince received a bride who in all respects enchanted him, and he enjoyed her to his heart's content as an elephant enjoys a lotus pond. 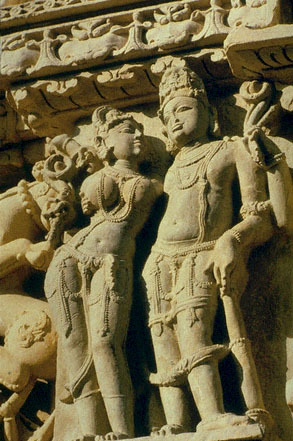 Sumangala had told the princess, "Be sure never to sleep apart from your husband at night, for your husband's mistress the fairy may suddenly come and take him away." One night, nevertheless, the princess was angry with the prince, and, though she was wide awake, she went to another room and pretended to sleep. Unwittingly, she did fall asleep. It was a year now since Sukumarika had gone to attend on her master, and the term of her service was over. The fairy found her lover sleeping alone and carried him off. He was never seen again.